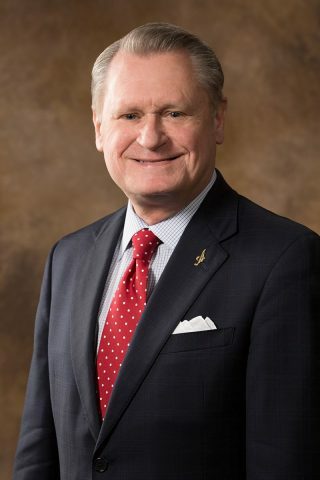 Dave Gearhart, former chancellor of the University of Arkansas, has accepted an appointment to the Fulbright Association’s inaugural Presidents Council. Gearhart served as chancellor from 2008 to 2015. He now teaches in the higher education program in the College of Education and Health Professions. The Fulbright Association Presidents Council is composed of nationally prominent former presidents and chancellors, charged with helping the association to develop stronger connections with higher education, to advise on strategic direction, and to help build membership for the program’s official alumni organization. The Fulbright Association extends the Fulbright international exchange into a lifelong experience for U.S. alumni. It connects alumni and friends of the Fulbright program through lifelong learning, collaborative networking and service projects at home and abroad. J. William Fulbright, an alumnus and president of the university and later a longtime senator from Arkansas, is credited with introducing legislation to establish the international exchange program that bears his name. He is also the namesake of the university’s J. William Fulbright College of Arts and Sciences.